I tried making Japanese cotton soft cheesecake twice before but failed both times– those two time my cheesecake was not cotton soft at all– the top half tastes fluffy like cake but the bottom half was too wet like pudding. Since then I was hesitated to make Japanese cheesecake again, until my neighbor had success baking this cheesecake then I decided to give it try– and it turned out good! Maybe I have better luck with souffle cheesecake than the cotton soft version :). I believe this is another type of Japanese cheesecake. 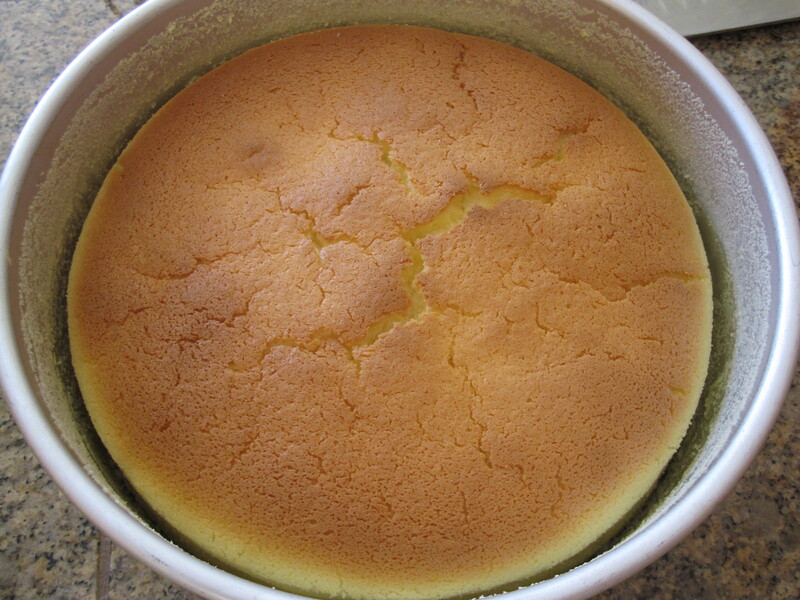 The texture is like souffle and so it is more moist than cotton soft cheesecake, which has more of a cake texture. Preheat oven temperature to 350°F with rack on the lower half (so the bathing pan is positioned in the middle of the oven). Boil a pot of water. Grease a 8×3 inch round baking pan. Prepare egg yolk mixture: Use a hand mixer, beat cream cheese, butter and sugar until smooth. Beat in egg, one at a time until well blended, scrapping the bowl occasionally. Add lemon juice, milk and beat until smooth. Sift in flour and continue mixing until smooth. Prepare egg white mixture: In a separate bowl, whisk egg whites with a hand mixer/stand mixer on high speed until foamy. While the mixer is whisking, add in cream of tartar. Then gradually add in sugar, scrapping the bowl once. Whisk until it forms a peak (pointing tip with a little curve). Gently FOLD IN 1/3 of egg white mixture into egg yolk mixture until just corporate. Repeat with the remaining egg whites in 2 batches. Pour batter into greased 8×3 inch round cake pan. Smooth the surface. Pull the oven rack half way out. Place a larger shallow baking pan or roasting pan on the oven rack and carefully pour in boiled water. Carefully transfer cake pan into the shallow pan and slowly push the rack back to the oven. Reduce oven temperature to 325°F and water bake cheese cake for 1 hour, until a skewer inserted into the cake comes out clean. Carefully take out cheesecake and let it cool completely on cooling rack. Chill in the refrigerator. 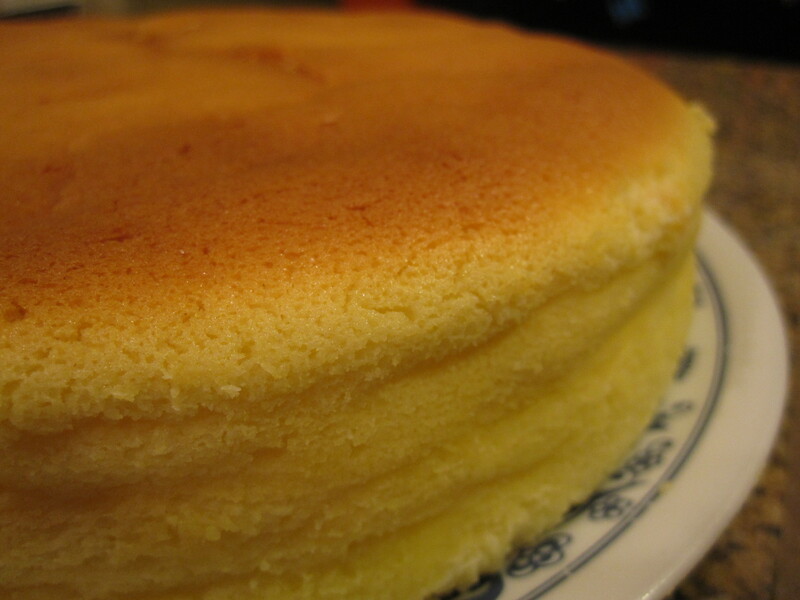 During baking, my cake cracked on the top after first 30-40 minutes, but rise very high to the top rim of the cake pan. Once removed from the oven, the cake start to shrink a little around edge, and sink to almost half way. So after cooling the cake is about 1.5 inches tall. The cheesecake is very moist and light like souffle, with a refreshing taste as lemon juice is added. Souffle Cheesecake-- it rises almost to the top during baking, and shrinks quite a bit while cooling down.